What is this sign signifying? Not exactly sure, but the moon is often thought to represent the Church as it reflects the light of the greater sun. 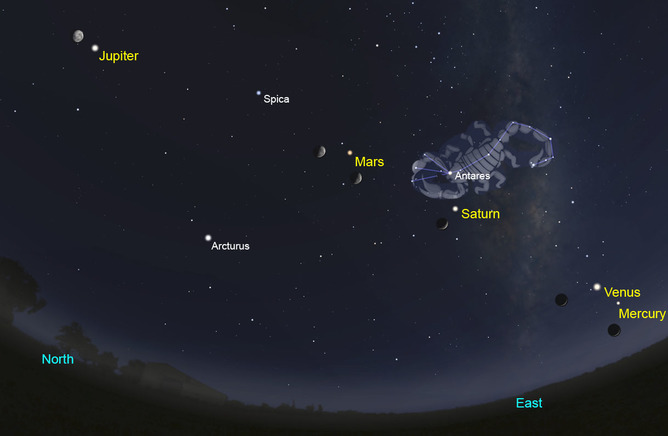 The alignment of planets is very rare, and even rarer that the moon would pass over them. Jupiter is the king planet and thought to be Christ's star. Mercury=Michael, Venus=Mother planet/when conjoined with Jupiter becomes the Star of Bethlehem, Saturn=satan, Mars=war/judgment. I see in that a pattern of the archangel blowing his trumpet, followed by rapture, followed by satan assuming control of his kingdom, followed by judgment, followed by the coming of the true King, Jesus.